In this blog post I will show a modern studio setup that doesn’t require a mixing console. Building a studio from the ground up over the past couple of years not only gave me the opportunity create a custom design, but also to reconsider my equipment and ways to improve the layout. With a space smaller than a typical commercial studio, maximizing every inch was crucial. The studio we designed takes advantage of many great modern-day components including several that sit on the desk, along with the classic studio mainstays of analog equipment in the racks including pre-amps, compressors, interfaces, and effects processors. The one large piece to this design puzzle that didn’t fit was a mixing console. I had to have a mixing console, right? All studios require them, don’t they? The more I thought about this the more convinced I became that a mixer just wasn’t necessary. And besides, I didn’t want to give up the desk space. With a lot of head scratching and some research we came up with a plan that would use a combination of standard 1/4 inch TRS and XLR patch bays in the rack which would give us all of the routing flexibility we needed and an easy way to get around. The key component I found to replace the mixing console was the the XLR patch bay. This was something that I hadn’t ever seen before, but was thrilled to learn that they exist. The unit I’m using is a Hosa PDR-369 . This takes the 12 XLR inputs from my snake one the back side and allows me to patch them through on the front to a Neutrik NYS-SPP-L 1/4 inch patch bay. I/O from the interface, pre-amps and effect processors are set up in the rear of the Neutrik patch bay so it’s just a matter of patching the correct channel from the snake to the pre-amp of choice and then to the interface input on the front. Patch bays require cables. Lots of them. I purchased mine in volume through monoprice.com. They are good quality cables and their prices are really low. An even better option would be to make your own cables. This shows the basic setup of the patch bays. This allows complete flexibility to patch any input from the snake into any preamp and patch additional outboard processing into the chain. This TRS patch bay is pre-configured in “half-normalled” mode with the normalled circuit in the back and a grey or white jack in the front that breaks the normallled connection when a plug is inserted. This turns it into “Isolated” or “Thru” mode. Because this setup uses isolated mode by default it made more sense to flip the PCB boards for each channel. This means that inputs and outputs patched into the back would now be mirrored in the front with no “normal” circuits. This allows for the greatest amount of flexibility between components and safely eliminates the possibility of feedback loops that could damage equipment. Having complete control through front panel access is key to the flexibility of a setup like this one. ***There is one important precaution with this setup. Pulling live cables and mics can cause damage to microphones and equipment so it’s always best to turn off phantom power and control room monitors when making patch changes. Getting back to the desktop, I employ a few very useful components that I like to have within easy reach at all times. 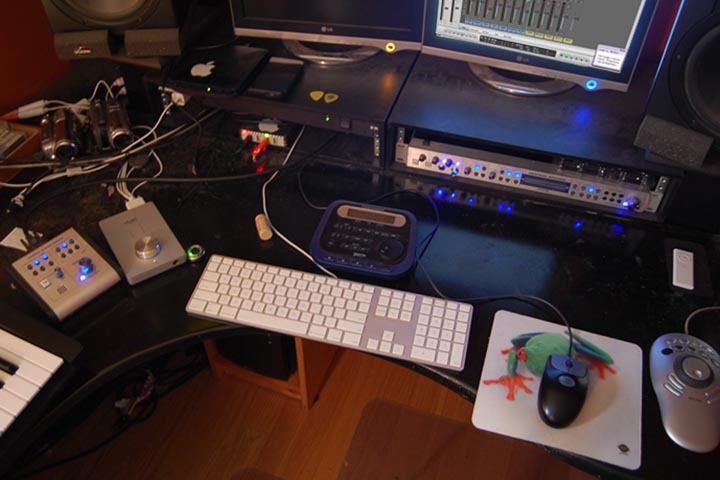 First is a Presonus Central Station. Using this Central Station with the CSR-1 Remote, I have instant access to levels, speaker switching, input switching and a talk back mic. The remote is about the size of my hand. I also keep a Frontier Design Tranzport on the desk for easy transport controls, scrolling etc… also about the size of my hand. In addition, there’s an Apogee Duet, Countour Design Shuttle Pro (for Final Cut Pro) and an M-Audio Axiom 49 keyboard controller all within inches. But most importantly, my computer keyboard and mouse are sitting squarely and ergonomically in front of me. Operating “in the box” and having the keyboard and mouse in a comfortable position makes the process run faster and smoother, especially over time. So far this arrangement has worked out great. At some point we may need a second patch bay that operates in a more traditional fashion with normalled connections, but as of today this setup has really served us well. This entry was posted in audio, Studio. Bookmark the permalink.